Since it's introduction in 1958, the Epiphone Texan has been the choice of countless musicians including Paul McCartney, Peter Frampton and Noel Gallagher. In fact, McCartney wrote and recorded "Yesterday," one of the most recorded and popular songs ever, on his 1964 Texan and still uses it on stage today. Now, Epiphone brings back the Texan combining all the great features of the original with modern updates for today's musician. The new Inspired by 1964 Texan acoustic/electric reproduces a vintage classic while providing years of worry-free enjoyment and with Epiphone's Limited Lifetime Warranty and Gibson's 24/7/365 Customer Service you know that can’t be bad. Get yourself a Texan today! Unlike dreadnoughts, the Epiphone Texan features a more rounded upper bout and a larger lower bout with a subtle waist resembling a bell shape. This design enables a more balanced tone with shimmering highs, deeper lows and a clearer mid-range that's perfect for singer/songwriters and solo performers. 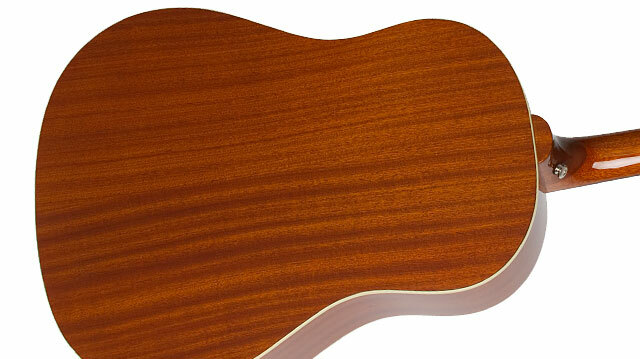 Like the original, the new Texan features a premium Solid Spruce top with a solid Mahogany back and Mahogany rims. Spruce is a tonewood that improves with age and playing time, so play your Texan a lot! We’ve done a lot to improve the Epiphone Texan without changing the guitar’s key historic features. The Inspired by Texan now includes a fixed, compensated saddle. Unlike the original adjustable style, the Texan’s new saddle provides improved tuning accuracy and better string vibration transfer to the top, which results in improved sustain. And for today's player, Epiphone adds Shadow's state-of-the-art Sonic™ preamp system with the revolutionary under-saddle NanoFlex™ low-impedance pickup to allow acoustic players to "plug in." Discretely mounted inside the sound hole, the Sonic preamp features an easy-access volume control with high and low EQ controls. There's also a "phase" switch that instantly cuts feedback without affecting tone. The Nanoflex pickup is the only pickup that senses both the vibrations of the strings and the movements of the soundboard simultaneously. 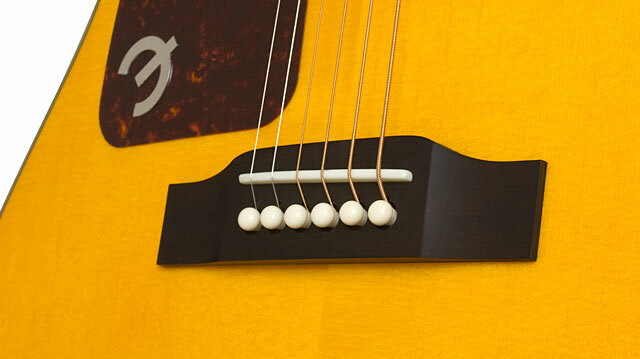 So, the sound is truly "acoustic," combining accurate body and string tone with percussive attack. It's like having a microphone mixed with an under-saddle pickup! Due to active amplification directly at the pickup and 100% shielding of the entire system, there is no signal loss and no "hum" created. A battery indicator LED turns on when the battery is low and should be replaced within 30 minutes. The preamp is powered by two 2032 lithium batteries and the complete system is extremely light and weighs far less than ordinary 9V systems. A premium Shadow output jack is incorporated into the endpin jack and the entire electronic system is covered by Shadow's 5-year worldwide parts and labor limited warranty.